Visit our store to sharpen your kitchen knives and scissors, most knives are $5.00 and scissors are $6.00. Turnaround time is usually 1 day, but often can be done the same day. fingertips — without spending time sharpening knives or exposing your employees to the hazard of dull knives. to learn about shipping your knives to us, so we can sharpen them and ship them back to you the next day. cutting. Not interested in rental, we sharpen yours also. If your sharpening steel isn't getting your knives sharp, it's time to re-edge the knife. If your meat grinder is making is not making chopped meat, it's time to re-edge the knife and surface grind the plate. Cutlery Mania's parent company, New Jersey Grinding LLC, has been sharpening knives for more than 50 years. We remove only the necessary amount of steel to re-edge the knife at the factory-recommended cutting angle. 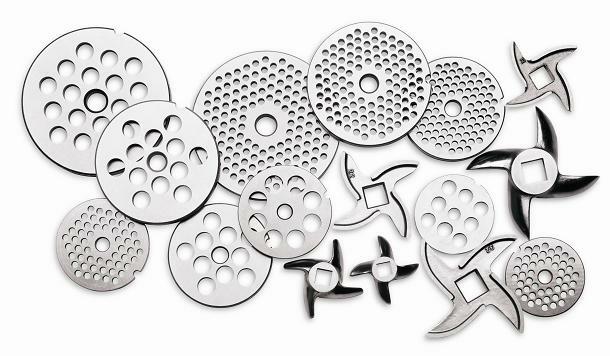 Meat grinder knives and plates are sand blasted, plates are surface ground and knives are edged. After polishing and honing your cutlery, we send it back to you the next day . Small knives (paring, boning) $5.00 each. Regular & Large knives (chef, butcher) $5.00 each. Return Shipping charge of $8.00. 1. Ship knives in a secure fashion, making sure blade is protected with cardboard or heavy plastic. 2. Fill out the Knife Sharpening Form. You must have Adobe Reader on your computer to open the form, which is a PDF file. 4. We will contact you by phone or e-mail if necessary.